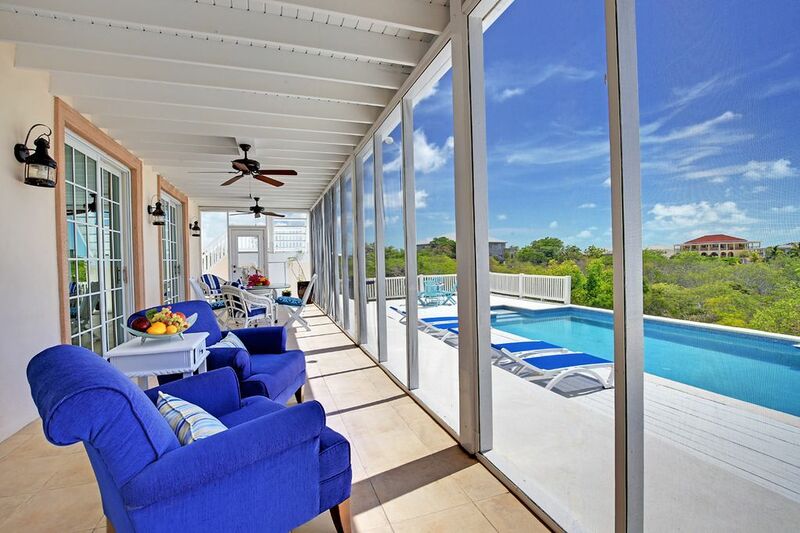 Grace House is een hemelse woning gelegen in het veilige gebied van Blue Mountain, Providenciales. Grace House is een stijlvol ingerichte 3 slaapkamer, 2 badkamer haven. Het huis bestaat uit een open vloerconcept interieur met een woonkamer, keuken en eethoek. Buiten is een royale hoeveelheid leefruimte met een zwembad, afgeschermde veranda met eet- en zitgelegenheid; een eet- en zithoek in de buitenlucht, een barbecue en een bovendek om te zonnebaden. Houd er rekening mee dat de glijbaan van het zwembad niet meer beschikbaar is. Slaapkamers: De master bedroom heeft een eigen badkamer geschikt voor een koningin. Er is een jet stream bad, inloopdouche, en zijn en haar wastafels. De tweede slaapkamer heeft een queensize bed, terwijl de 3e slaapkamer twee tweepersoonsbedden heeft. Buurt: Blue Mountain is een veilige gemeenschap gelegen in een hoger gelegen gebied van Providenciales. Daar vindt u luxe villa's en high end privéhuizen die uitkijken op het eiland. In de buurt bevindt zich het afgelegen Babalua-strand, dat een mooi uitzicht biedt ten westen van het huis ..
Vervoer: Om het eiland te huren is het makkelijk. Er zijn verschillende autoverhuurbedrijven op het eiland om aan uw behoeften te voldoen. Het eiland herbergt ook een waaier van taxi-exploitanten en VIP-vervoer. This villa is perfect for a family getaway. Staying at the house provides more privacy than at a hotel. The location is in the middle of the island so easy to drive to any part you would like. The outdoor area was excellent with plenty of space. There is very nice landscaping. The pool was wonderful. There is a nice view of the ocean but there is a big yellow building (car rental) right in front of you. The inside is older but kept in relatively good shape. The open floor plan is very convenient and spacious. The beds were comfortable. The villa is in need of a deep clean and some things need to be replaced like the faucets and screens. Most of the screens had holes so bugs could get in so we needed to keep them shut. But the air conditioning worked very well and quickly. We really appreciated some of the things provided at the villa like a cooler, beach chairs, shampoo/ conditioner, television and towels. Grace house exceeded our expectations. It was well-maintained inside and out. Kavita was professional and very friendly . She answered our questions about places to eat and things to do as well as any questions about the house. My husband and I especially enjoyed the screened porch overlooking the pool. There is a double lounger located on the porch where we enjoyed reading and taking naps . We enjoyed the privacy of staying in a home versus being at a resort. We felt safe at the house especially with the alarm system. The beaches here are some of the most beautiful I have ever seen. We also enjoyed exploring the island with our Jeep rental. We would love to go back to Turks and Caicos some day. If we go back we would like to stay at Grace house again. Janet and her husband were such a lovely couple. They were very friendly and polite. I assisted them with all questions they had on things to do and places to eat. They were tidy guest and I would recommend them to any host. Please do come back again to Grace House. Would love to have you. Nice central location to both ends of the island. This house was an older bungalow style kept in relatively good shape. Master bath faucets showed their age. Termites have reached the upper level balcony steps. I wouldn’t call it a luxury abode, but for a week it made a lovely getaway with ease of access by car to beaches and restaurants. We used the kitchen frequently which was well equipped minus a blender. Pool was kept clean and at the perfect temperature to cool you off. Dryer was in the process of being replaced. I never saw the new one. The alarm system worked without a hitch. The motion detector lights went off every time the wind blew through the trees. We ended up unscrewing the bulbs so we could sleep at night in the dark instead of the on and off blinking lights. Neighborhood dogs set each other off in choruses of barking day and night. Beds were passably comfortable. I guess everyone has their own preference for what’s comfortable. Master bedroom has a very bouncy mattress that transfers movement to bed partner. We were happy to return to our home at the end of 9 nights. The persons or ompany that manages the rental villa, aptly named Grace House, are the master manipulators of the the oldest game in the book; the bait and switch. Please do not be fooled by the photos that are posted online, as you will be disappointed upon arrival. My friends and I arrived at Grace House on October 4, 2018, but the house was, clearly, not prepared to receive us. I had to specifically request that the house be cleaned, prior to being able to comfortably settle-in after our flight from New York. Secondly... the pool pumps were inoperable, transforming the infinity edge pool (which was the major selling point of our reservation) into a large container of standing water. Malaria and dengue are among the main dangers of stagnant water, which can become a breeding ground for the mosquitoes that transmit these diseases. Therefore,we were unable to utilize the pool for our entire visit; the daily temperature was 80 degrees on average. We were forced to pay an additional $89 per day to utilize the pool at the nearby Club Med resort. And “no,” we were not offered to be reimbursed for this inconvenience. In addition, the grounds surrounding the house are quite poorly kept. Both, the interior and exterior, are maintained only to a surface extent, and can easily fool the novice traveler. We were informed that the washer/dryer were also inoperable, after checking in and via a message. As a political science major, unfortunately, I am academically trained to over-analyze most situations. However, as a Human Resources Professional, I am professionally trained to provide a +1 customer experience 100% of the time. When the, aforementioned, discrepancies, and other minor concerns, were brought to the property manager’s attention, her initial response was: “Well... this is the Caribbean!” (which is a proverbial slap in the face to all of the Caribbean countries that I have previously visited, wherein my accommodations and service were impeccable). Subsequently, and to add insult to injury, she proceeded to ask us to leave (yeah... she tried it... wrong guy). With that being said, The island of Provo is an amazing place, and it’s “belongers” and transplants, alike, welcomed us with open arms. However, our experience with Grace House was definitely our worst vacation rental experience to date. You have been officially warned. Beautiful home away from home in paradise! !